B.F. Goodrich Company Building at 225 West 57th Street in Manhattan. Photo: LPC. Developer supported designation of one building but opposed designation of related structure. 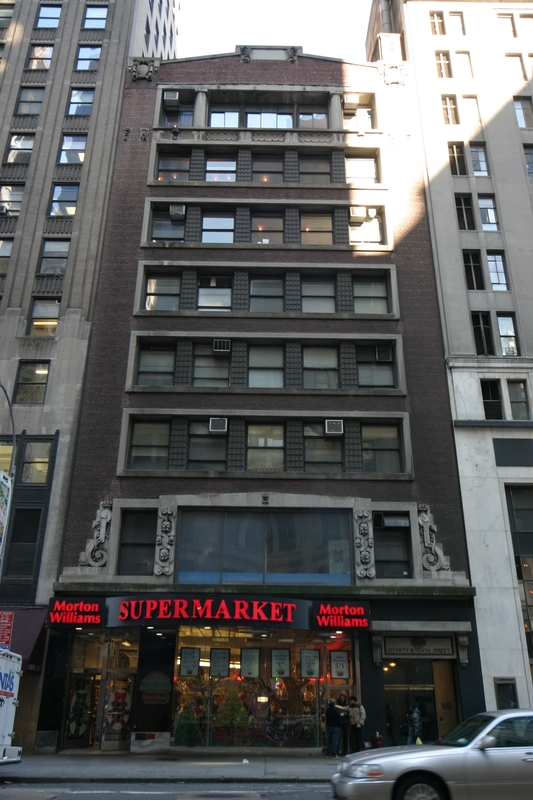 On November 10, 2009, Landmarks voted to designate the B.F. Goodrich Company Building at 1780 Broadway as an individual City landmark, but not its sister building at 225 West 57th Street. Howard Van Doren Shaw designed and built both structures in 1909, using elements from the Chicago School and Vienna Secession movement. The area of Midtown was then known as “Automobile Row,” housing the offices and showrooms of several car-related companies. At an August 11 hearing, representatives of the buildings’ owner, Extell Development, testified that Extell supported designating 1780 Broadway but opposed protecting 225 West 57th Street. Attorney Paul Selver stated that Extell was not aware either B.F. Goodrich Company Building was under landmark consideration when it acquired the properties in order to redevelop the site. William Higgins, also representing Extell, argued that all the architectural significance resided in 1780 Broadway and that it was appropriate for Landmarks to make separate designation decisions when considering the two buildings. 6 CityLand 124 (Sept. 15, 2009). After the hearing, Landmarks received a letter from City Council Speaker Christine C. Quinn and Council Members Jessica S. Lappin, Daniel R. Garodnick, and Melinda R. Katz stating that they supported designating 1780 Broadway, but suggesting 225 West 57th Street did not merit designation. The council members pointed out that 225 West 57th Street’s designation could “fatally compromise the footprint” of Extell’s proposed development project. The commission voted to designate 1780 Broadway and decalendar 225 West 57th Street by a vote of six to three, with Vengoechea, Byrns, and Gratz voting no. LPC: B.F. Goodrich Company Buildings, 1780 Broadway, 225 W. 57th Street, Manhattan (LP-2380) (Nov. 10, 2009).